Life is tough, I know it is. If you’re reading this maybe you feel like your life is falling apart. Maybe you just lost a family member, got fired, lost a baby, etc. I can say one thing for sure, God is near to you. Even in the midst of our darkest days, God is there. I have been where you are, and still am in many ways. Whether you are dealing with grief, depression, anxiety, pain…these verses are for you. So often we look to friends or family to “say the right thing” when the only things that can help are written in the Word of God. The Bible is full of peace and strength for us if we use it. These are verses that have helped me and my family. I have prayed them in the shower, on my knees in an ICU room, and in my mind every time Satan tries to bring anxiety into my heart. I personally am trying to teach myself to turn to God first, and one of the ways to do that is to constantly be thinking about His word. These verses are verses that have got me through the last year. Only God. I pray that these help you as well. If you feel like your life is falling apart, turn to God. Claim these verses over your life and situation. 1 Hear my cry, O God, listen to my prayer; 2 from the end of the earth I call to you when my heart is faint. Lead me to the rock that is higher than I, 3 for you have been my refuge, a strong tower against the enemy. 4 Let me dwell in your tent forever! Let me take refuge under the shelter of your wings! 11 For I know the plans I have for you, declares the Lord, plans for welfare[b] and not for evil, to give you a future and a hope. 12 Then you will call upon me and come and pray to me, and I will hear you. 13 You will seek me and find me, when you seek me with all your heart. 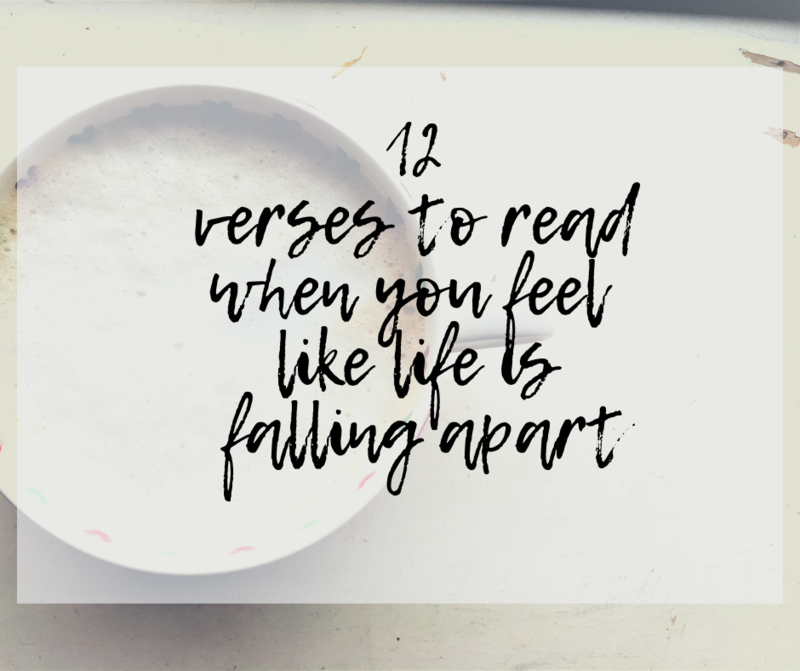 What verses do you turn to when life is hard and feels overwhelming? These verses are full of Gods peace and comfort- let those sink into you today!